Different soccer positions named and explained! We all have our favourite soccer positions. Mine is playing as a right sided midfielder. I love the balance of attack and defence from this area. I enjoy dribbling at (and sometimes beating) defenders too! 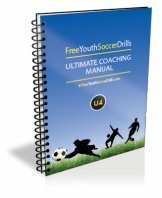 The 'skills and tricks' page from this website can help you learn to beat players 1 on 1. For Skills and Tricks - Click Here! Every position requires a player to adopt particular roles and responsibilites. 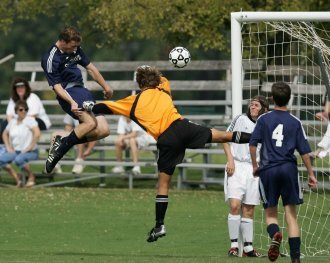 A central defender for example needs to be composed and a strong header of the ball. Where as a striker is expected to score goals for the team. This page will look at all of the conventional positions as well as less used ones. The positions will be broken into 3 categories. To check out any of these positions, just click on the link below. Remember not to worry too much about formations until youth players reach the age of about 8 or 9. Player development is the key! 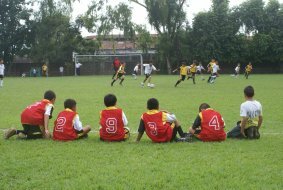 Help them to develop skills and turns and let them enjoy the beautiful game by just playing. then click here for a wide selection of formations! This page will show you what's best for attacking, defending or having a balanced formation. As a coach, it is a good idea to allow young players to experiment with different positions in your team.A player may struggle in one position but be particualrly good in another. This will allow them to get a feel for what's expected from different areas on the field. It will also allow you to see what specific area is best for each player in your team.